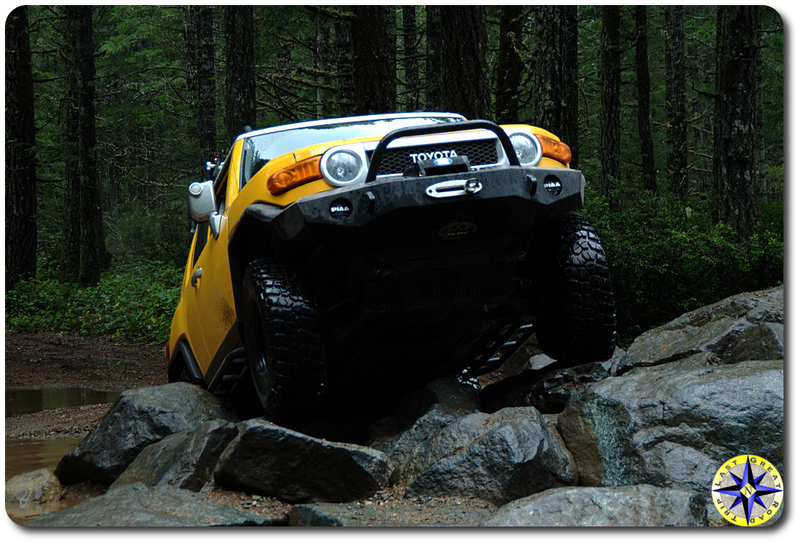 We met up with the club for an off-road adventure through the Tahuya State Forest. 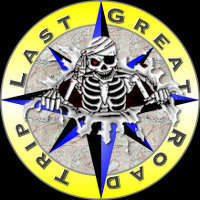 The crew included the likes of seriousactualist, amaintaylor, kurtfriedrich, Marsh, Macleod, conversejohn54, The Shocker, and ropedrag. We all met up in Belfair at the local Safeway. It is amazing what locations become the standard meetup spot and for Tahuya this is it. When Hula Betty and I arrived the parking lot was full of FJs and Jeeps. A couple of old friends 1TUFTOY and LA were there readying to go out with another group of Jeeps we had wheeled with a year back. A quick stroll through the Safeway deli to grab a box lunch and it was time for the drivers meeting. This was going to be an explores run since no one had been here in years and the trails are always changing. After a quick forest service map review and CB check, we were ready to head out to the trail head, ten minutes from town. The trail head parking lot provided a good place for all of us to air down and double check the gear. 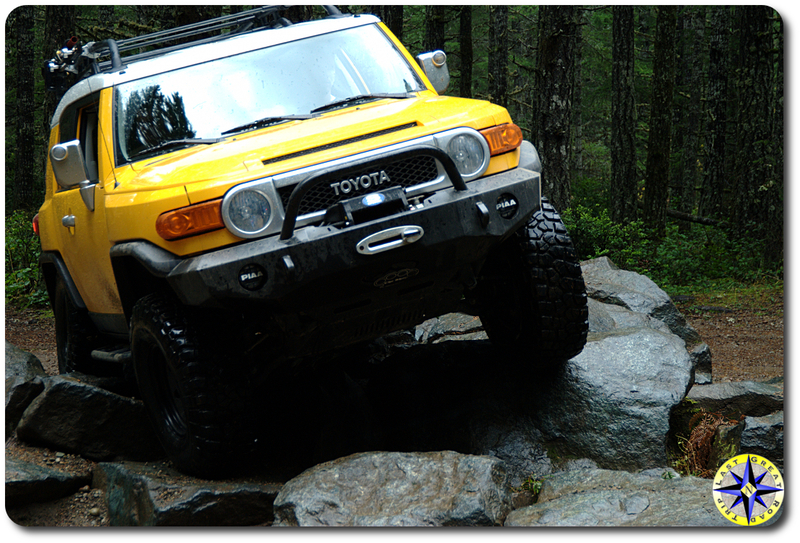 It also gave us a chance to see the other FJ’s and their various mods. 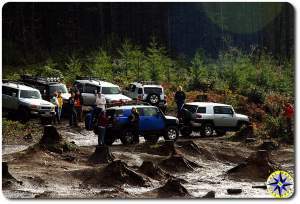 The great thing about off-road adventures with the club is that it is family oriented. 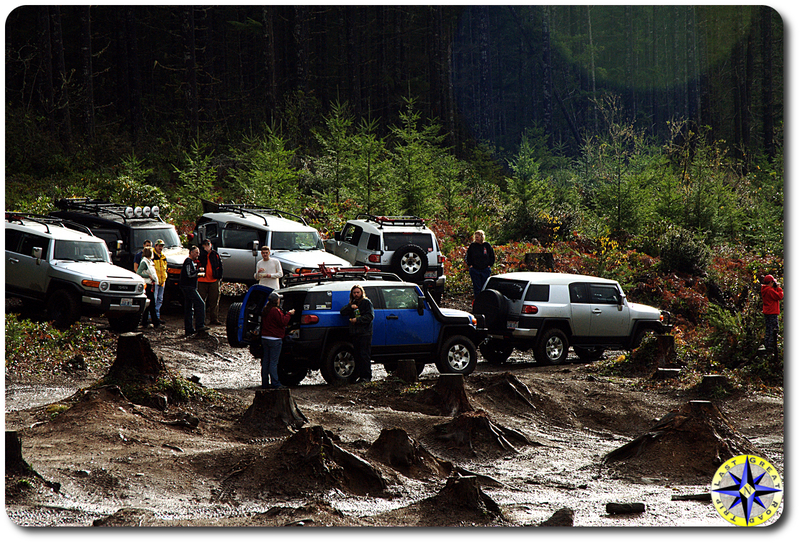 Moms, dads, kids and friends all show up to go out and get dirty. 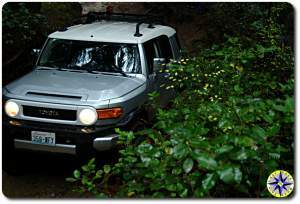 Although we are getting better at driving 4×4 trails, we still have a lot to learn and the Tahuya Forest is a good classroom. Most of the trails are relatively easy but you can find some real traps if you’re looking to test the limits of your skill and your rig’s metal. Everyone escaped this off-road adventure unscathed but we’ll all have to wash our rigs when we’re done. Brazil has the Amazon, Florida has the Everglades and the Northwest has it own rain forests. The rain had been coming down all week and mother nature was not done yet. 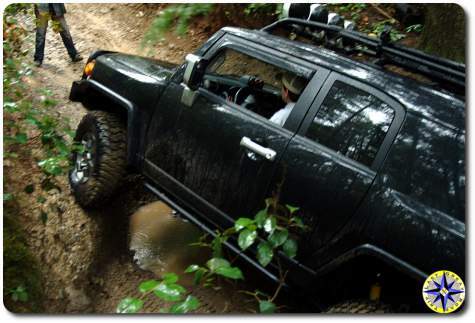 The trails were filled with puddles deep enough to test our scuba mods and although there are no piranha or alligators, the muddy puddles do hide rocks and roots that keep your hands tight on the wheel. We followed the trails over the hills and through the woods, down to the mud lake for a little surf and turf. The lake is great place to through a little mud high in the air but don’t let it’s placid surface fool you… the middle is deep and sticky. 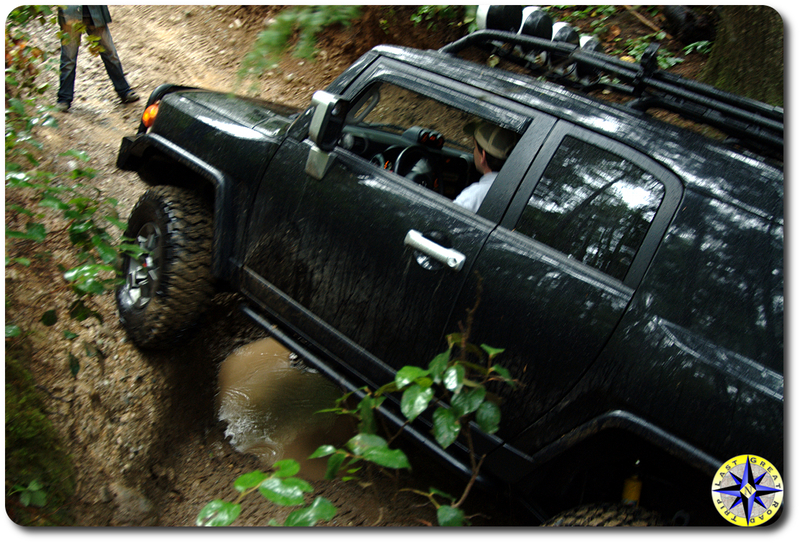 Unless you want to test your recovery skills you stick to the sides, which still come up to the fender wells. After lunch the group headed to a muddy climb that when you walk it, you see the broken glass left behind from other rigs who have attempted this tricky little stretch in the past. Thanks to the spotting of Jerry and Marsh everyone made it up and over without a scratch. 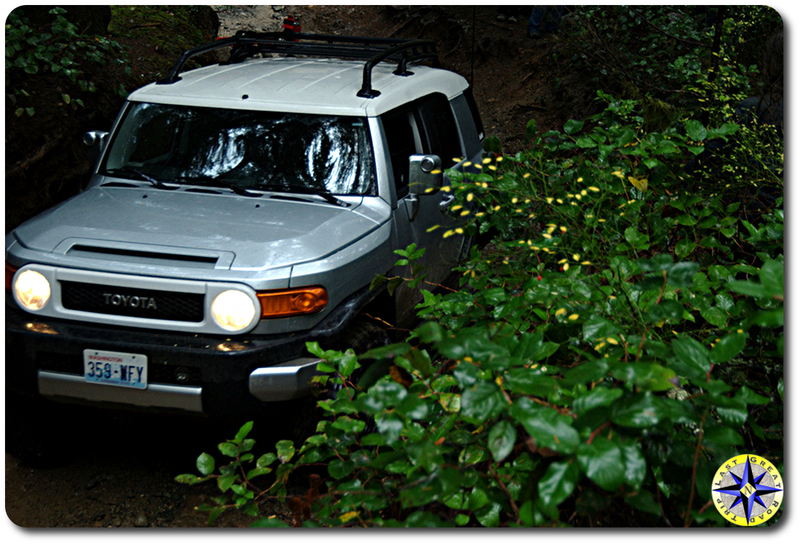 From here we doubled back and headed to a rock pile where Jerry showed us what an FJ is capable of with right setup… and good spotting. The drive back to Camp Spillman was more of the same fun stuff and by 2:00 we were aired up and heading home. This was one of the few runs where we were the only FJ Cruiser not checking the ferry schedule. Hula Betty and I wound our way back to Bremerton through some old logging roads just for the fun of exploring a new drive home.